The Antimicrobial Preservative Efficacy test measures the effectiveness of antimicrobial preservatives added to nonsterile dosage forms or multi-dose containers in order to inhibit the growth of microorganisms that may be introduced inadvertently, either during the manufacturing process or product use. Antimicrobial effectiveness must be demonstrated on all injections packaged in multiple-dose containers, multiple-dose topical and oral forms, and other dosage forms which contain antimicrobial preservatives. This test should be performed on all aqueous-based products that include ophthalmic, otic, nasal, oral, irrigation, and dialysis fluids. Testing performed by Nelson Labs meets the criteria set forth by the USP General Chapter 51 on Antimicrobial Effectiveness Testing. This test can also be performed to comply with requirements detailed in the European Pharmacopoeia or other international standards. We have extensive experience working with the USP organisms, as well as an excellent understanding of preservative systems and effective neutralization techniques. We provide scientifically sound data by plating in triplicate and offering multiple replicate testing. We also have the resources to test samples with minimal wait time. The Antimicrobial Preservative Efficacy study tests antimicrobial preservatives against the following organisms: Candida albicans (ATCC 10231), Aspergillus niger (ATCC 16404), Escherichia coli (ATCC 8739), Pseudomonas aeruginosa (ATCC 9027), and Staphylococcus aureus (ATCC 6538). 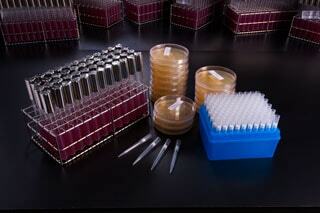 The bacteria are grown on soy casein digest agar plates (SCDA) and harvested on the day of testing. The yeast is grown on sabouraud dextrose agar (SDEX) and harvested on the day of testing. The mold is grown on SDEX and harvested within a week before testing. All organisms are adjusted to approximately 1.0 x 108 colony-forming units (CFU)/mL by diluting in sterile saline. Individual test samples and a positive control are prepared for each organism. At the 0-hour, the test samples and positive controls are individually inoculated with each organism to reach a concentration of 1.0 x 105 – 1.0 x 106 CFU/mL. The volume of the inoculum used is between 0.5% and 1.0% of the volume of the product. The positive controls and samples are assayed immediately after inoculation to determine the challenge level and to provide confirmation that the samples were inoculated. After the samples have been inoculated and the 0-hour assay has been performed, the samples are stored in a 20 – 25°C incubator for the remainder of the test. At 7 days, 14 days, and 28 days after inoculation, the samples are removed from the incubator and assayed for surviving organisms. At each of these time points, an aliquot is removed from the samples, diluted in an appropriate neutralizer, and plated according to the standard plate count procedure to determine the remaining concentration of organisms. The organisms recovered from each time point are compared to those seen in the 0-hour positive control. Changes in the concentrations of organisms are converted to log reduction values for assessing the antimicrobial effectiveness of the samples, according to the ISO 14730, EP or USP 51 criteria. If you have additional questions about Antimicrobial Preservative Efficacy test services, or would like to consult with the experts at Nelson Labs, just send us a request or call us at +1 (801) 290-7500.